My thoughts on two books I read very close together. They resemble each other and, therefore, nearly tell the same things. But I claim only one as the “victor” that has stolen my heart. Allow me to tell you the story of how I came to know these two books. I shall try to keep it as short as possible so that I won’t bore you, but long enough so that you may understand where I stand and why I stand there. I think the first time I knew of Paulo Coelho’s The Alchemist was when I walked inside a Barnes and Noble, seeing all the on-sale books on a table and finding it there. Unfortunately, I judged the book by its title and mysterious cover and started reading. The language was simple, but it seemed interesting. Yet it wasn’t interesting enough for me to read it. I put it down and moved on. I don’t remember when I first heard about Antoine de Saint-Exupery’s classic, The Little Prince. However, I knew that it was a famous work, and one of my friend’s who was an aspiring illustrator told me that it was very good story. One day, when my mother and I went up north to visit our aunt, we stopped by a Barnes and Noble because my mother was looking for a book (I don’t remember what it was). However, in the children’s section, I found The Little Prince, and started reading it on the spot. The narrator’s tale of how he wished to be an artist resonated with me, and I could see how it struck my aspiring-illustrator friend. I wanted to read more of the story. But we had to leave. I find it funny how I’m 18 years old and still love childish books and games as much as adult things, but then again, why should I care about what other people might think about me? Fast forward to Christmas 2011, and I am at a Barnes and Noble closer to my home shopping for Christmas gifts for my friend who is an avid reader (this is a different friend from the aspiring illustrator friend I mentioned earlier). 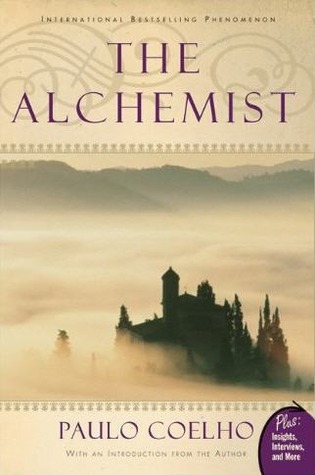 I bought a copy of The Alchemist for her. I hoped that she liked it, because it seemed interesting to me when I saw it those months ago. Then nothing else really happens as I’m reading. He meets a king, then gets scammed by a thief, works at a crystal shop… It’s very… dull, to me. I stop reading it for awhile, and while doing the inventory for the library a few weeks later, I discovered an original copy of the Katherine Woods’ translation of The Little Prince. I was planning to get a copy once I had the money, but when I found it in the library, I went giddy like a five-year-old. I had never been that excited to check out a book from the library. Ever. Something just took me over when I checked the book out. Even though the book is very short and full of the narrator’s illustrations, I read that book in one day. Needless to say, I was changed for good by The Little Prince. Then I continued The Alchemist. Again, it goes on about people’s Personal Legends, the Soul of the World, the Language of the World, then the title character appears. I think, Ah, cool. Something’s going to happen. And… in a way, it does, but it doesn’t. They just keep walking along to Santiago’s treasure. Soon, I arrived at an ending that didn’t satisfy me. And on the back of my checked-out copy of The Alchemist, I discovered a review that says Coelho’s book—the book I just read, is “as memorable and meaningful as Saint-Exupery’s The Little Prince” (Austin American-Statesman wrote this review, apparently). The coincidence was uncanny. All that time, I never checked the back of The Alchemist thoroughly enough to see what was essential. When I finished The Alchemist, I was completely on the verge to saying that this book was like The Little Prince, and the review said it for me. However, I disagree with this review blurb of The Alchemist. The Little Prince is, no doubt, a book meant for those who cherish their imaginations, and who want their souls to guide them on the best path they can get in life. I admit that at times, the plot and story don’t make sense (i.e. we never find out why the prince would want the narrator to draw a sheep, how he could get a flock of birds together to get off his asteroid, etc.). Yet these flaws do no detract from the wonderful experience one receives. To my detriment, I am not equipped with a personality that makes me question everything as I go along. Because of that, I think I am much more attached to the nonsensical, whimsical, and fantasy realms of fiction and even animation. This is probably the reason why I loved The Little Prince so much. While it resonates with children due to the simplistic language, it also resonates with adults from the wit and timelessness of the characters. To me, The Little Prince revealed its wisdom gradually through the prince’s personal journey as well as the narrator’s with the prince in the desert. There is no doubt that The Alchemist is a beautiful book, and that I will remember it. Yet I will remember it in a bad way and not a good way, because I will see my own stories and pray they’re not the reflection of Santiago’s journey. It isn’t for me, and it might not be for you. Finishing it today, I spoke with my friend, telling her that I regretted buying her this book for Christmas (I’m also glad I got a gift receipt for it in case she wanted to return it). Talking with her about it and what I didn’t like about it, she said to me that when she read The Little Prince, she did not find it to her liking, and therefore she might like The Alchemist more than I did. The Alchemist may be for you what The Little Prince has done for me, or the other way around. But these are only my thoughts, which I may change later or not change at all. In the end, an alchemist tried to tell me to listen to my heart using words like Personal Legend, Soul of the World, and Language of the World, which I found fascinating but unnecessary. The little prince from asteroid B-612 was much less intrusive, to me. Even though he may have been a complete figment of someone’s imagination, I grew to love him for what he represented rather than what he did. Antoine de Saint Exupery won this “fight”, I suppose. But I was the only judge. Now it is up to you to decide. On an interesting note, both these books have deserts as a setting. Makes you wonder about the desert as a literary device, doesn’t it?